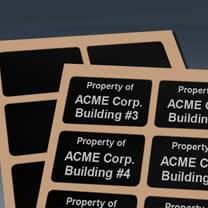 MPC's Anodized Aluminum blank labels and tags are an ideal choice for on-site marking using YAG or fiber lasers, or engraving processes. Our anodized aluminum blank labels provide exceptional resistance to weather, abrasion, corrosion, chemicals and solvents. Backgrounds are available in black or a variety of colors and are sealed beneath a durable anodic layer. Why Choose MPC's Anodized Aluminum Tag and Label Blanks? Provides superior resistance to abrasion, chemicals, solvents, and extreme temperatures. A more cost-effective alternative to AlumaMark BlackPLUS in select applications. Black graphics offer the greatest durability with an expected exterior life of up to 10 years. Color options are less UV-resistant and are not recommended for long-term outdoor use. Manufactured using anodized aluminum face stock. After fabrication, edges and holes of the finished parts are not anodized, but an optional secondary process will anodize, alodine or paint edges for increased durability and protection (on thicknesses of .063" or greater). Anodized aluminum face stock (optional thicknesses .003", .005", .008", .012", .020", .032", .063", .090", .125"). Matte (non-reflective with flat finish), Satin (lustrous semi-reflective material), #4 (brushed to resemble a stainless steel finish), Gloss (highly reflective, mirror-like). Note: #4 starts at .032" thickness; Gloss is available in .020" only. None. Labels are blank for on-site marking. Color options available. Note: Black possesses the greatest durability. Other colors have limited UV resistance. Not recommended for long-term outdoor use.